A lot of attention has been paid lately to the long-term damage NFL players suffer from concussive hits that are inherent to the game. But the league has consistently turned a blind eye to blows sustained by women at the hands of many NFL players over the last two decades. That all changed this week when TMZ published a video of Ray Rice knocking out his then-fiancée (now wife) Janay Palmer in an Atlantic City casino hotel elevator on Feb. 15. Within hours, the Baltimore Ravens cut Rice and the NFL suspended him indefinitely. Commissioner Roger Goodell called the video "sickening" and insisted that neither he nor other league officials had previously seen it. But months earlier a publicly released video showed Rice dragging his unconscious fiancée from the elevator and leaving her limp body on the floor. That wasn't sickening enough? Not to the NFL, apparently. Among other missteps, the Ravens posted the following statement on Twitter on May 22: "Janay Rice says she deeply regrets the role that she played the night of the incident." Worse, Ravens Coach John Harbaugh, in an effort to support his player, said: "It's no big deal. I stand behind Ray. He's a heck of a guy." It was only after Rice was sentenced to probation and ordered to enter a pretrial treatment program for first-time offenders that the commissioner suspended him, and then only for two games. Given that the NFL suspends players caught with pot for four games, the two-game penalty seemed pathetic. In August, Goodell publicly apologized for the way he had handled the matter, and he unveiled a new policy that calls for an automatic six-game suspension for "a first-time violation … regarding assault, battery, domestic violence or sexual assault that involves physical force." A second offense would result in a lifetime ban from the NFL. It's a nice gesture. But it appears hollow. Days after Goodell made the announcement, San Francisco 49ers defensive end Ray McDonald was arrested on suspicion of assaulting his pregnant girlfriend. The police report refers to visible injuries. Despite complaints from fans and retired 49ers who are in the Hall of Fame — Steve Young and Ronnie Lott — the team allowed him to play and the league stood behind that decision. So this nagging truth remains: It should not take a graphic video to get the NFL to do the right thing. For too long the NFL has had an antiquated playbook when it comes to players who commit domestic violence. I first encountered this in 1997 while conducting research for the book "Pros & Cons: The Criminals Who Play in the NFL." For the book, we analyzed 264 criminal complaints filed against NFL players on rosters during the 1997 season, and found that 47 of them involved alleged domestic violence. NFL players were charged with domestic violence more often than with any other crime. Yet time and again, the NFL took no action, and if players were cut by one team after being arrested, they were often quickly picked up by another. A top player on the Miami Dolphins allegedly choked and beat his pregnant fiancee in the shower. Months later, shortly after the baby was born, the player was accused of severely beating his wife again. Yet even after he pleaded guilty to lesser charges as part of a deal and served jail time, the league did not sanction him. A member of the Atlanta Falcons allegedly tore his 3-week-old child from his girlfriend's arms before beating the mother over the head while threatening to kill her with a handgun. He later was accused of kidnapping and beating the same girlfriend in a car and charged with aggravated assault, two counts of kidnapping, reckless endangerment and false imprisonment. He pleaded guilty to a lesser felony as part of a plea bargain, and was cut by the Falcons. But he received no discipline from the NFL and was picked up by another team by the start of the next season. The NFL was well aware of these two cases and scores more like them. But back then, NFL spokesman Greg Aiello infamously told the Washington Post: "We're not the criminal justice system. We can't cure every ill in society. You know, we're putting on football games. And unless it impacts the business, we have to be very careful about the disciplinary action we take. A player has rights too." The NFL likes to point out that its players do not commit acts of violence against women at a higher rate than males in the general population. That's true. It's also irrelevant. The bottom line is that NFL players aren't like men in the general population, especially in the eyes of children. Rather, NFL players are seen as action heroes who epitomize strength, athleticism and toughness. That's why so many kids emulate them. And that's why one instance of a celebrated player using his muscle to harm a woman is too many. The sad fact is that the most memorable hit of the 2014 NFL season will end up being one in which a player knocked out a woman in an elevator. 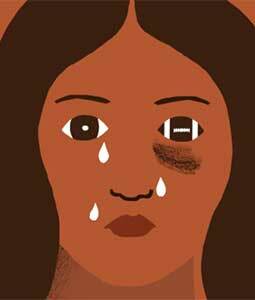 Meantime, the NFL continues to pay lip service to how seriously it takes domestic violence. This last week, Carolina Panthers owner Jerry Richardson insisted: "I stand firmly against domestic violence." Yet his team continues to allow defensive lineman Greg Hardy to play while he appeals his conviction on charges of assaulting and threatening to kill his girlfriend. A Mecklenburg County, N.C., judge found Hardy guilty in July after his girlfriend testified: "I was so scared I wanted to die." The NFL is in dire need of male leadership when it comes to violence against women. In the wake of the Rice video's release, Ravens owner Steve Bisciotti sent a letter to stakeholders that outlined mistakes, apologized and promised a better response in the future. "We can help put more of a spotlight on intimate partner violence," he wrote, "while increasing education and awareness to this issue to all in our organization." The best weapon the NFL has against domestic violence is its legions of past and current players who are model husbands and fathers. They are the silent majority. Those men have the power to change the culture. The league just needs to give them a platform. Jeff Benedict is a special features writer for Sports Illustrated and the author of "The System: The Glory and Scandal of Big-Time College Football."